HA! Blogger just ate my post, before I got to publish. I feel so. . . so. . .experienced now! I recreated what I remembered. I'm pretty sure that song is on one of the Tom Chapin CDs that we own. If you don't like children's music, you might like his. Brother of Harry, the songs are nice, and only sometimes overly preachy. The lyrics also describe how I'm feeling at the end of today. The dog is doing very very well. 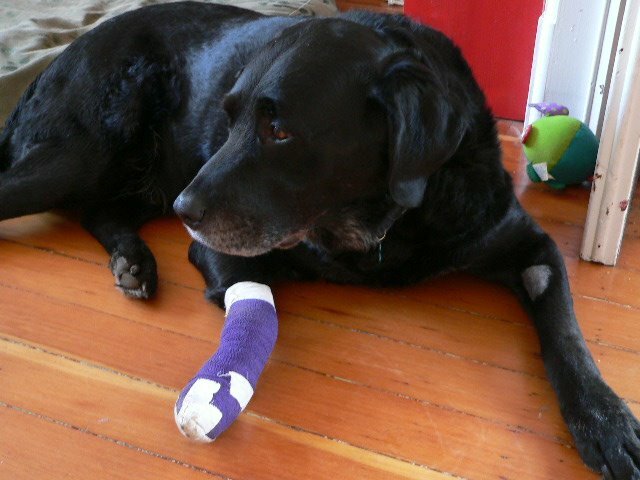 Vet check yesterday, no sign of infection and he'll go back in a week for stitches out. He's cruising the table and counters for food and even running some. The bees -- I opened the hive yesterday and have some questions. The workers are building comb on the foundations but I didn't see any capped cells or eggs. I'm going to do it again in a couple of weeks. Thing 1 is my Bee Tour photographer, but I haven't downloaded the latest batch yet. I'm feeling a little lazy. Today started with an all-neighbor breakfast. I brought brioche cinnamon rolls, hot from the oven. Mmmmm. Lots and lots and lots of kids, good neighbor talk/gossip, a great way to start the day. Soccer game for Thing 2, to which we all went. A friend of ours and her son are coaching another under-6 team, and the players are just so cute. Our team had a time focusing on anything but the lizards, but finally I promised to bring my kids back another day just to hunt lizards, so the game could commence. Thing 1 went off to a production of the Two Gentlewomen of Verona, with her wildly indulgent aunt and uncle, and the rest of us noodled on home. I got to run. This makes three weeks in a row that I've done my workout as planned. I don't want to count this chicken before it hatches, but I'm excited. Easy dinner, some vigorous Crazy 8s, and the kids are all in bed. It wasn't that everything was sweetness and light today (thank you, Matthew Arnold), it was just . . . whole. Thing 3 lost it before bed, and it was okay. I dealt with the fit without needing to get into his business about it. Thing 2 had her issues throughout the day, and the house still isn't where I need it to be to feel settled. But it's okay. Instead of knitting, I think I'm going to follow those children into bed. Days like this don't come around too often -- I want to cherish this feeling. For each of you who sent a nice message about Mack The Good Dog, thank you sincerely. I know that Dar and Suzee both really know what they're talking about, because they have each taken care of him when we've done some rare traveling without his doggy company. I'm sure that if he could respond, he'd thank Emma and Kristi for their warm thoughts, along with Janis and Lily. And for those of you also who don't know him but spared him a thought, like cat person Allison and b, thanks too. I know he's feeling a little better today (though still on heavy pain meds) because at dinner time he managed to get off of his living room dog bed, limped to the dining room, and took up his assigned position under Thing 4's high chair. There he did his part by inhaling every grain of rice and blob of refried beans that she was joyfully whisking to the floor. We don't call him the Mackuum cleaner for nothing. I hope he'll soon be back to his swashbuckling self. 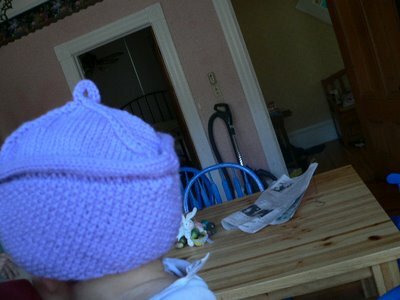 This post isn't about my knitting (guess who is having trouble getting that baby present started?) or even about someone for whom I'm likely ever to knit anything. This post is about Mack. I have dear friends who don't want to talk about or read about dogs, and they may now push another button on their browser and mosey along. Go ahead, we'll wait. . . Okay, Mack isn't like other dogs. Really, I know every dog owner, just like every parent, feels that their little one is secretly more special than others' average dogs or children, but Mack really is. I have independent confirmation. Mack came into our lives on a whim, by accident, nine years ago. We were sitting in the front yard of the house we were sharing with friends, and he came running along the street, accompanied by a golden retriever. His tongue, as I recall, looked as though it weighed about 3 pounds. Down to his knees, it was. And he was wearing one of those cartoon bulldog collars -- the ones with the little silver pointy things sticking out? So we scooped up the dogs and tried to find owners for them, but were stuck with them. Mack was the one we ended up with. He was gorgeous and nice, and we just knew, even then. Not like other dogs. He ended up being the big, calm dog that meant "dog" to our kids. He started out terribly afraid that we were going to leave him. He'd wail when left in the car or tethered outside of the library. 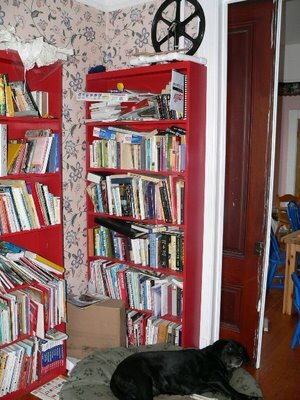 Once he ate the door frame of my parents' apartment on a visit. Sometimes, helpul people would call the police, certain that he was being hurt or had been left in the car too long. I loved that part. He does that less and less now. Once, when we were living with yet another set of friends, I looked up to see their then 3 year-old standing on Mack's side, using him as a stool to reach the sink for hand-washing. Mack just looked at me. He has been subjected to numerous indignities by toddlers, from being smacked with a block, to having his tail pulled, to having his food taken out of his dish while he eats. He's the dog that my oldest child learned about dog training and walking and expanding her sphere of independence with his company. And through it all, he's been patient, and dare I say, kind. When my dog Jackie died, before I had children, I wondered if I would ever feel this way about a dog again. Mack has been a dog of my heart just like that, even with my own children to love (another worry I had). Fun to run and hike with, cozy to hang around with, quiet and gentle when things aren't going so well, he's a real friend. After watching him in the house one day, a friend told me to not ever get a Labrador assuming that it would be like Mack. 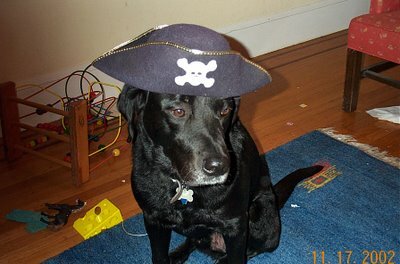 "He's not a typical Lab," she said. And tonight, Mack's hurting. He just had surgery today on a nail bed tumor that the vet had some bad feelings about. She said she took some of the good bone above the nail bed, just to make certain that she got as much of the dangerous stuff out as she could. He's never been a huge stoic, and he's true to form tonight. So spare a warm thought for a Very Good Dog. That's the Was-Going-to-be-an-Easter-Sweater sweater, complete with a rose over a snap (my preferred sweater closure for little kids -- the snap, not the rose). And behind it? That's my new smoker for my new beehive. The beginner's kit came and the bees are neatly ensconced in their new home, and as far as I know, busy doing what it is that bees do. 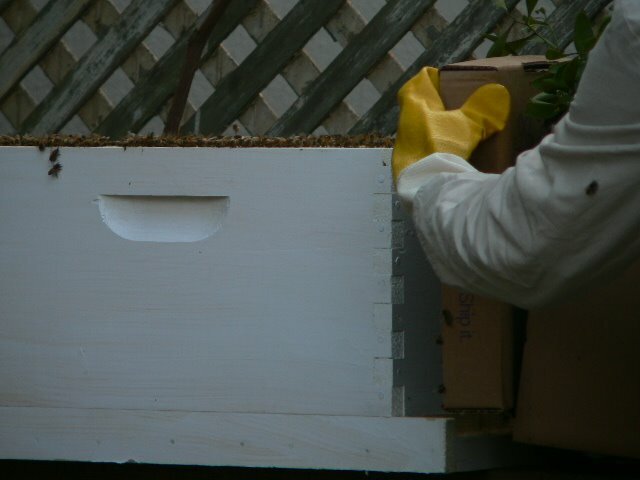 This transfer, from cardboard box to hive box, was less traumatic for me, now that I had done some reading and knew more of what I was supposed to be doing. It struck me as I was reading that beekeeping, like knitting, or dance, or learning a language, might be one of those things where the beginning is easy. As you go on, though, it gets wider and deeper, and suddenly you've spent your life doing something and yet you're describing yourself, like some crazy Zen master, as being a beginner at it. Anyhow, that's how I feel about knitting, and I think bees can have the same effect. So, it's not so much bravery, as some comments suggested (although I don't like being stung, it's really not a Big Pain), as just figuring that people have done this for hundreds of years, so how hard can it be? This attitude is both a blessing and a curse in my life, as my spouse can attest. Dressed in my new veil, and not yet armed with a smoker, I got ready to move them. Since the sugar water had worked so well the first time, I decided to use it again. 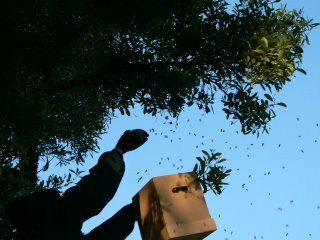 When I opened the box, there was a smooth, almost conical comb structure, covered with bees, hanging from the lid of the box. How to get that into the hive box was the big question. They had done a good job cementing the comb on. The books talk about "brushing" the bees off, but my hands weren't good at that. I tried using a stick to pry it, a clipboard to scrape it, and finally used a combination of scraping and smacking it against the edge to dislodge the bees. Then I gave them a few moments to calm down again. You can see the remains of the wax on the box top. Then I set up the box so that any bees that hadn't made it in in the great smacking could walk in under their own bee volition. Frames, holding a pre-embossed comb starting sheet of plastic coated with beeswax, hang from the top like file folders in a drawer. It's on these that the queen lays her eggs in little cells the workers build up. Did you know that a honeybee's stomach makes wax automatically if she stores honey in it for over a certain amount of time? This is one of those facts I picked up. The wax extrudes from her abdominal scales, and the honey/wax ratio is kept balanced because if there are enough wax cells already made, the workers can dump the honey into them for storage. If there isn't, it becomes wax, and she makes storage cells. So incredibly cool. These frames are mostly to help the hive build up strength. 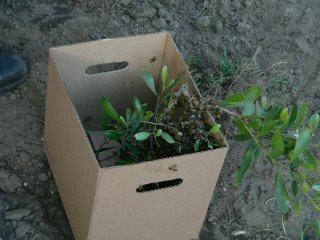 After the lower box is full of new baby bees, the keeper, in this case me probably, adds another box and frames above the first. 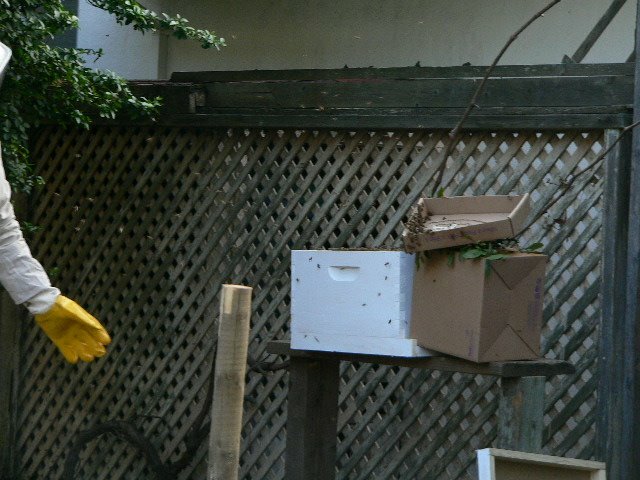 When that box is half full or so, a "honey super," or half-sized box with frames, is put on top, with a screen to keep the queen out so no babies get laid in it, and that's where the honey is stored. If that's going to happen here, it's months away. Since the bees haven't swarmed out of the box, I assume the queen is in there, happily laying eggs. Next Saturday, I'm going to fire up the smoker and see if I can find her by lifting up the frames. By then I hope they've forgiven me for crushing some of the bees with the hive top. 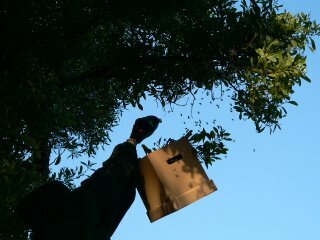 I tried not to, as the books say helpful things like, "PLace the lid on, avoiding crushing any bees." They were a little thin on just how you did that, and I'd like to make a formal apology to the bees for the ones I killed. Sorry, bees. I'll do better next time. Next time I'll use a brush and push them away. I'm still trying to figure out how to keep the ants off of the legs of the stand and therefore out of the sugar water feeder and hive. Before then, I'm going to take Thing 4 out in her new ensemble, and finally get that baby blanket done. I'm having guilt dreams about babies needing knitted gifts and me not coming through. I love getting comments on my blog (really, really, really love getting them). And sometimes, when I comment on someone else's blog, I'll get an email back. That's pretty special. So when I get comments, I mean to email people back and say -- Thanks! But there's not always an email option to get back to them. Do you want me to say thanks in my comments? In the blog body? Never? So, if you want me to email thank-yous, please give me your email address. I've decided on a pattern for a baby-to-be's present. Now I'll just finish up that sweater today (or, more accurately, finish up the yarn for the sweater -- I think sleeves are a future project) and launch right into that little gift. 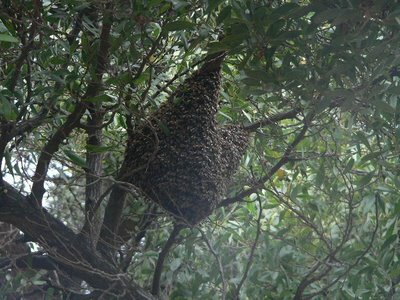 Two or three days ago, the new hive in the tree formed another hive, and that new clump has been a little antsy. 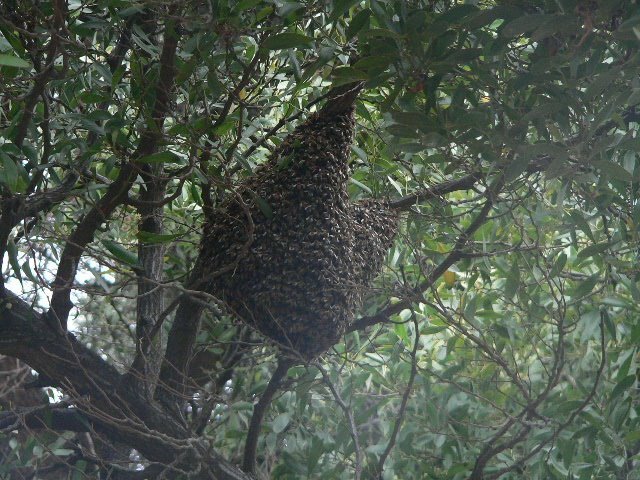 I didn't know if they were missing a queen, and so searching for a new place -- there was comb started at the old location -- or just wanting a better home than the exposed tree. So today, I finally got through to a local bee guy -- someone who will come and relocate swarms for people -- and he gave me the lowdown on moving a swarm into a new hive. 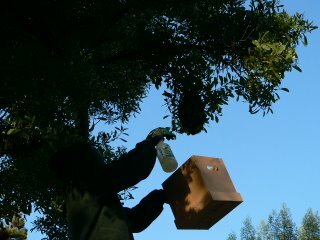 He told me to make a simple syrup, then to wait until sunset or so, to spray a cardboard box with it (in the absence of any real beekeeping equipment), spray the bees (he said it would both calm them and stick their wings together, which cracked me up), then either brush the bees into the box or clip the branch if it were small enough to do so. 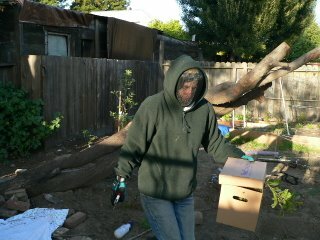 He also told me where to order a hive box, frames, and foundations. 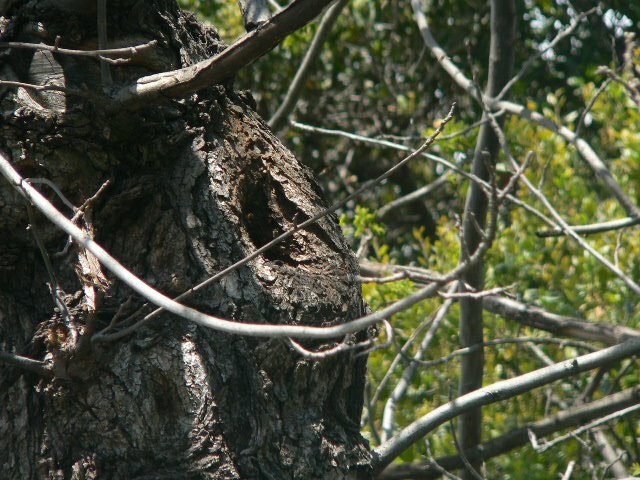 Near the end of our conversation, I said, "I just have one more beginner's question: Am I going to get stung?" He said, "Yes, you're probably going to get stung." "Oh. Well, but I've given birth four times -- I'm okay with pain." Do you not have a veil?" [Note: this was said as though it were common household equipment, like postage stamps. ]"You really don't want to get stung in the face." I had to agree there. Then, inspiration struck. "I have my daughter's fencing mask!" So I called and ordered the Beginner's Kit #1, made simple syrup, got a free box from Kinko's, and bought a new spray bottle, the last one being spirited away by some child or another in my house. I also cobbled together a terrific bee suit, made up of the mask, my leather jacket, a hooded sweatshirt over the mask, jeans, Eric's woodworking gloves, and my gardening boots. I also made my spouse record the whole operation. 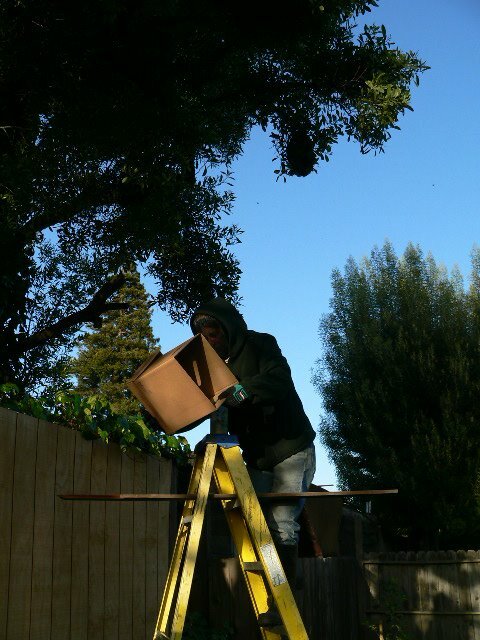 The ladder wasn't quite high enough for safe operation, but I figured that I'd be too worried about the bees to worry about falling to my death or disablement. They got a little testy at this point. I don't think they expected that jolt. Even with them being fairly agitated, they weren't attacking, just kind of flying around with a "Hey, what's going on? Oh, no you don't!" kind of vibe. One bee rode my arm a long time, and it was very odd to see them on the mask. 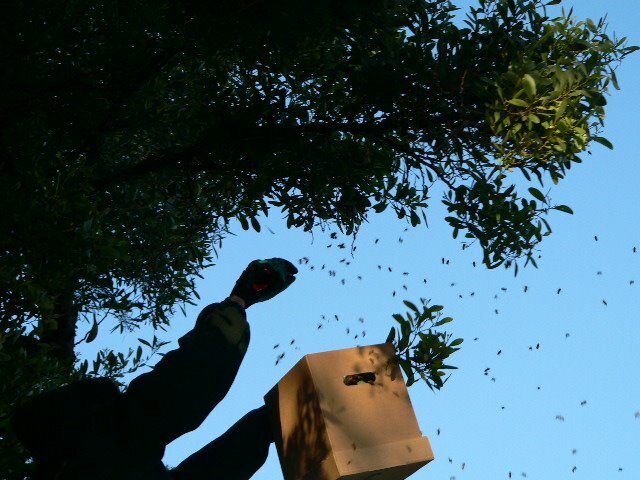 Hey, presto -- boxed bees. I was so excited that it had gone that smoothly and I wasn't lying on the ground with a broken neck that I could hardly walk across the yard with the box. There were no stingers in my jacket, no stings on my body. Now that I'm seriously convinced that these are Quite Nice Bees, I'm going to have to learn how to help them do well. This is all assuming that somewhere in that rugby-ball-sized clump is a queen. I have a couple of books ordered from the library, and the Bee Guy said the kit I'd ordered would have a booklet that would tell me everything. I figure it's like anything else; I'll just learn as I go, and the bees will probably be good teachers. Now I'm going to have to reread The Secret Life of Bees to see how to greet the (hopefully resident) queen. Can goats be far behind? Most advice about happiness or goodness or spirituality bandied around right now seems to suggest that mindful living in the moment is pretty much the way to go. When I run, I try to think, "My foot is rolling onto the pavement. Wind is in my face. 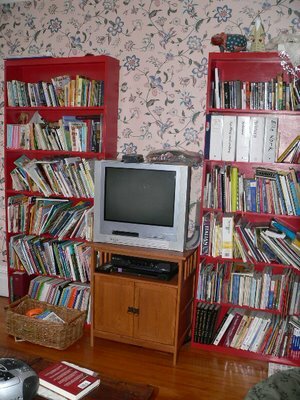 . . " When I'm reading to the kids, I try to be aware of the pressure of their bodies against mine, and the feel of the pages in my hand, the words in my mouth. But I'm not the mindfulness type. The most prosaic thing these days can catapult me right out of the present moment. So I'm chopping parsley and oregano from the garden for dinner tonight, and something about the light slanting through the leaves (remember, it's been raining what feels like steadily until yesterday morning) plus the sharp smell of the leaves, jerked me in two directions at once. I remembered holding summery bowls full of fresh tabbouli -- heck, I remembered pouring boiling water over the bulgur to make that tabbouli -- and the lemon/garlic/parsley smell rising up from the bowls. Simultaneously, I thought about the summer to come and the bowls of tabbouli waiting to be made from the parseley growing in my garden. Which immediately catapulted me back into my far past -- into my grandmother's garden in Tennessee. Travel being what it was then, and being one of a family of six children, we didn't go and see her that often. 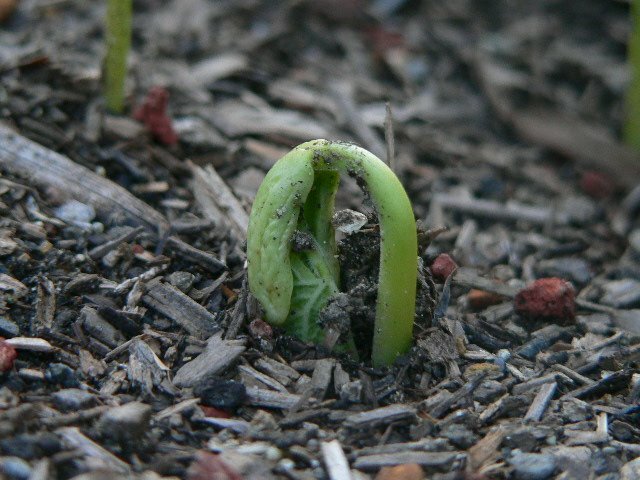 But I do remember sitting and helping her shell beans that she'd picked, and getting up in the morning and seeing her, in a faded housedress, working among her plants. In the subsequent two generations, I can count the gardeners on one hand. It seems to be a recessive gene in our family. 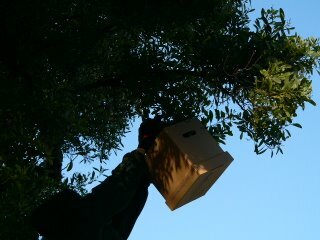 Swooping on to the future, I was with the tiny plants outside, now huge and heavy with fruit on stem and branch. 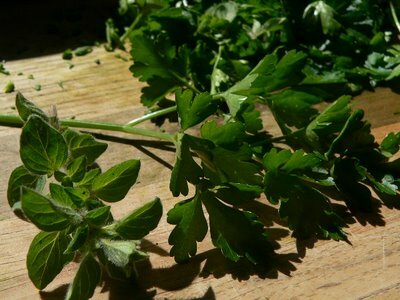 I finished making the lasagne for which I was parsley-chopping, and whoosh! Off I was back into my sister's kitchen, while she showed me how she made lasagne. "I never have to think about whether I have lasagne noodles." 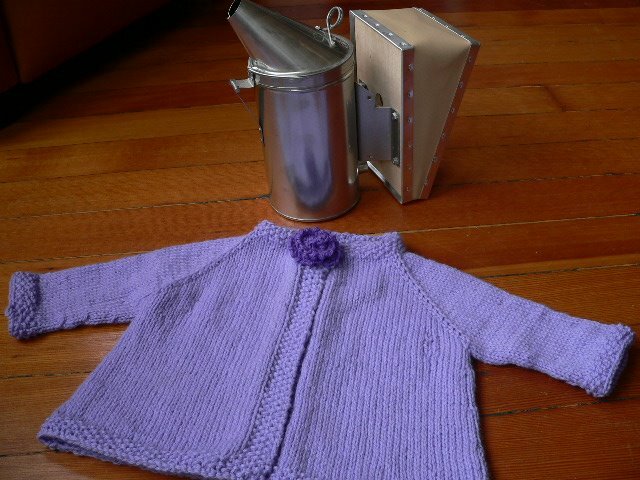 Later, while dinner cooked, I sat with my kids and read to them and knit some more on the little lavender sweater which may, actually, never be done. It dawned on me, though, that even if I'm such a slow knitter that I only knit two rows every day, eventually -- off to the future -- I'm holding a finished object. By that time, of course, this smallest child in my house will most likely be well and firmly too large for it, but there might be another child somewhere who could wear it. Shutting my eyes between pages, I saw one of my Things with a child of their own. I'm not yet ready for that kind of time travel! I had better just knit faster. 1. A good few hours ahead, or the night before, make a mid-size saucepan of polenta. I don't know if my technique is the best; I boil water and pour the polenta in while stirring. I salt the water and stir more as it thickens. When it's nearly done, I like to stir in a goodly, but proportional, amount of fresh grated cheese such as Parmesan or Pecorino Romano. 2. Pour the polenta into a loaf pan(s). Set it aside to cool completely. You can put it in the refrigerator if you must. 3. Unmold the polenta onto a cutting board or platter, and slice it as you would bread, as thin or thick as you prefer. 4. Use the polenta as you would regular flat pasta for lasagne, arranging the slices so that they mostly cover the surface of each layer. Cook and eat! It's terrific, and the baby was completely covered in it after our meal. She had polenta in her neck rolls. And for the first time in weeks, very few "yucks!" were heard at table. Aaaaaah. Of course I didn't finish the sweater, although true to form I probably knit nearly all of a sweater between the trying/ripping back/trying again sequence that seems to be a required portion of any knit project of mine, whether self-designed or from a pattern. Can I distract you with lovely garden closeups? You're actually fortunate that I didn't title this post "We Got the Beet," because I love puns and gardens, and you know. . . I'm generally pretty sleep-deprived. This shot makes me feel all full of hope and potential. It doesn't, however, mean that I can knit any faster. That's probably enough to make your eyes glaze over if you're not a gardener by practice or avocation, and if you are, I've got plenty more. Just email and I'll send you lots and lots. Oh, thank you all for your wonderful comments about the bees. No secrets have been shared with me so far, but I must confess that I'm getting closer and closer to wanting to call someone and get a hive box and perch it up high on a stake around the chicken coop. . . I must be going mad, really truly mad. They're such a lovely bunch of bees, though, really they are. 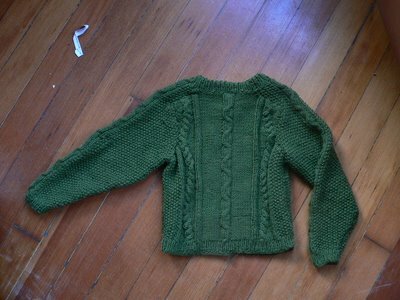 Now, as to the little sweater, I have plenty of good excuses about why it's not done, but they don't matter. Fortunately a snotty nose kept the intended wearer home from church on Sunday, and I'll be done soon enough -- if I don't run out of yarn. Notice a theme here? 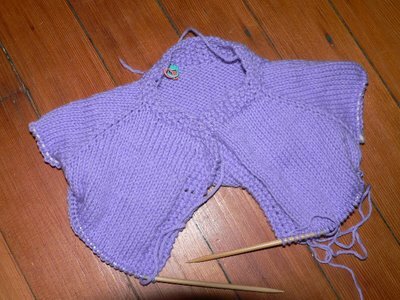 It would have gone faster if I'd either decided to knit it in the round and steeked or decreed that it was a shrug and not a sweater. I'm increasing now that I'm on the body, every few rows or so, to make it flare. So far I've only increased under the arms, but I'm thinking that I might need to add a couple along what would have been the dart lines in the back to make it look more like I'd intended to flare the sweater and less as though I had just lost track of what I was doing. What do you think I should do? I even forgot to bring it along today, and I had a big chunk of down time that I could have used to knit, while Thing 2 stalked and caught lizards and Thing 1 chortled and crawled around putting oak leaves in her mouth. It was a glorious day, and I barely minded not knitting. We may go back to this regional park for a camping trip -- soon, I hope. One part of my quotidian life that I enjoy very much is the occasional moment of "ordinary grace," or "backyard magic." The times when the regular ol' day is unrolling, and somehow, a window opens into the numinous. It can occur at any time, around any activity. Sheer grace. So, the other day, the older children and I were in the back yard (in a rare moment of sunshine), gardening and puttering, respectively. A sound finally registered in my addled brain -- a deep humming. At the same time, Thing 3 said, "Mama! a bee that can't fly!" We picked it up on a stick, and it was fine, just walking around. What it also was was much larger than most bees. A drone. A thought began forming in my brain. 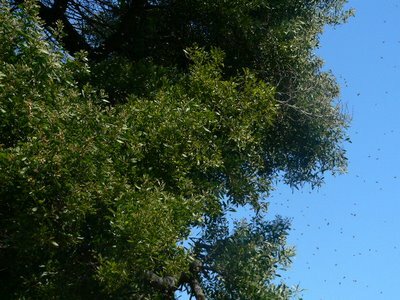 When I looked up, I saw something I've never seen before -- a cloud, an absolute cloud, of bees pouring out of the hive in the neighbor's walnut tree. I had been very excited when we had noticed that first hive, as we've put in a number of fruit trees and as everyone learns when they're children, bees help pollinate fruits and vegetables. Good insects! We were in a mass of bees. They flew in the air, they flew in circles around our yard, they landed on us, got caught in our hair, and no one got stung. We just brushed them off and they went about their very important business. Swarming, on the first bright day in weeks. Although the apiarist I spoke with said that the new queen would move the hive in a couple of days, I sort of hope they work it out to stay there. As I said, I like the bees. And besides, they're magical. Maybe I'm going to have to furnish some sort of hive box, up high on a pole. I don't want to keep bees, I just want to have bees, for themselves. 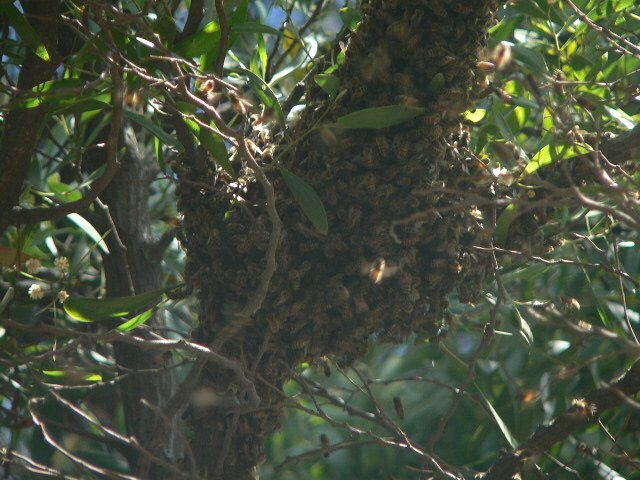 I also don't know if the old hive is stll viable, and they just swarmed because it was getting crowded, or if the original queen died. Place marker at beginning of round. Knit in seed stitch (k1, p1 to end of round, ending with a k1, begin next round p1, k1, continue. When brim is as tall as you want, k1, kf&b around entire round. I wanted a tall look, so mine's about 3"/7 3/4 cm. With second needle, I went up a size, cast on 5 stitches, toward the "inside" of the hat. Using another needle, make i-cord and pick up a stitch from the original needle and knit it together with the 5th stitch each time -k4, K2tog, slide to the other end of the needle, pull yarn around and repeat. This attaches the i-cord to the top edge of the hat. At the end of the i-cord round, break yarn and sew the live stitches from the last needle to the cast-on part of the i-cord. Using whatever size needle makes you happy -- I stayed with the larger one -- pick up stitches on the inside of the i-cord or the top of the brim all around. Make it a multiple of however many decreases you want. I wanted three, so I ended up picking up 120. Place markers evenly around the picked-up stitches, and k every round, k2tog before each marker and ssk after each. Decrease on every round. Fewer stitches would have made a flatter brim, and that's a look I wanted, but I'm not going to redo it this time. At the end of your decrease rounds, when there are between 6-4 stitches left, switch to making i-cord again, for just a few rounds. Break yarn, draw end of yarn through the remaining stitches on the needle, pull it through the hat, and secure, tightening up any little holes. 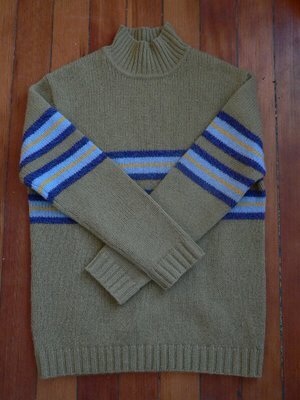 Now I'm going to see if I can pull a Rain and knit a matching top-down, swingy, seed-stitch bordered raglan sweater to match. By Sunday. Thing 4's Easter dress is really thin. Wish me luck! 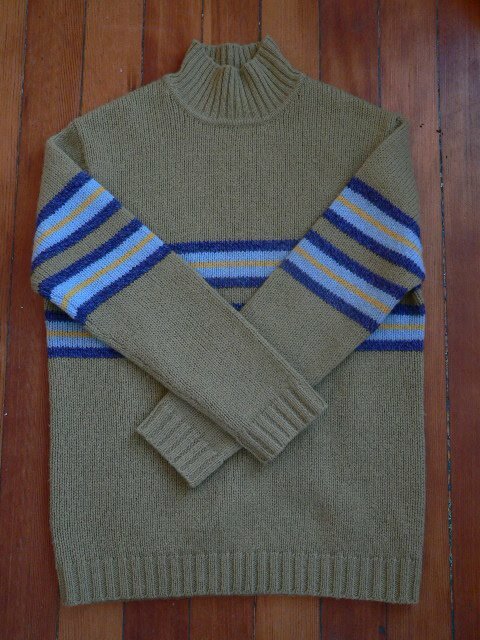 Since I'm still luxuriating in the accomplishment of the finished sweater, here's details. I literally have to order Thing 1 to take it off, which makes me even more sad that I was so worried about the amount of yarn I had and needed to make it so slim. She won't hear of me ripping out the bottom to extend it, and so I'm just going to have to plan to make her another sweater later this summer to wear next winter. Hey! it's a good thing that it's so rainy, I guess. She'll have more cool weather to wear this before she outgrows it. That should happen in about a week, given her age and past history. Folks have mentioned that the other kids can wear it, but I'm not sure Thing 1 will be able to handle that. It might just go into the cedar chest I've commissioned from Eric (heee) for future grandchildren, years and years ahead. Front shot. Bonus points if you can spot the error that is going to make me rip out a seam and redo it. For those of you who wonder at my sanity, I'm leaving some "cabling on the wrong row" errors on the sleeve saddles and one mis-done seed stitch. So there. I'm not nuts. The sleeve cap fudging (I made them much shallower than the saddle-shoulder pattern I was referencing suggested) worked well. I started the decreasing, and then just kept laying the sleeve caps (on the needles) up against the fronts and backs until it looked about right. Apparently that kind of "improv within structure" knitting works best for me, since I'm mostly incapable of following instructions. Here's the back. Nice bit of trash on the floor, no? I swear, I ask them to pick up. . .
And a closeup of the folded collar. This was a new technique for me, and I love the stretchy feel of it. I'm not certain that a purl folding row works in 1x1 rib, but it's what I've got. And no, my fingers are not purple, although it's cold in here. They're. . . finger colored. And that's that. 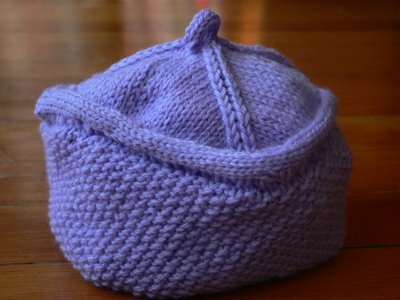 I have a new design for a hat on the needles, and if it works as well as I hope, I'll post a pattern when I'm done. 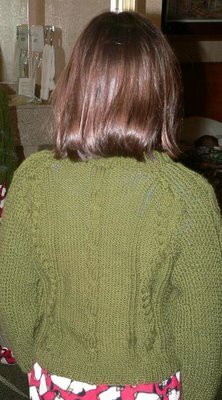 Meanwhile, I have to re-do the seam on this sweater, deal with sick children AGAIN, and get the house back under control. The DI team didn't place, so we don't have to stress about not having enough money to travel to the next level. I still think they were marvelous, but some technical difficulties during their performance lowered their scores. C'est la vie, and I don't think they're too traumatized. I'm loving the idea of having our time back from rehearsals! And, I think that Suzee needs to make up her own non-fiction book meme. Can it count as tagging if I just command her to do it? Consider it done. Before I did something I've never ever done before yesterday, I cleaned some of the house. I read out loud to Thing 3 while the bigger sisters were at the ballet (hooray for Swan Lake -- I never thought it would darken our door again, after Thing 1's ferocious love affair with it during the Fairy Wing years). I even did some seaming on the sweater and began the neckband. But I didn't finish the sweater then, because I had to make a dinner to leave behind. Then I did the never-before-done thing. I left Things 2 and 3 alone with their father. Overnight. And boy, oh boy oh boy, did I appreciate it. 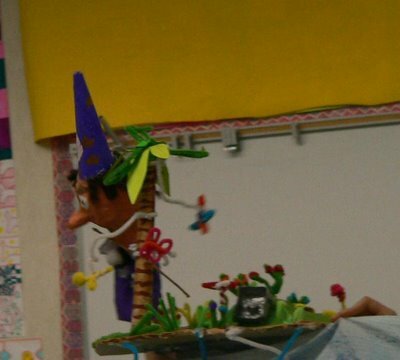 He cheerfully took over the night and day duty so I could take the other children for Thing 1 to compete in the state level of Destination Imagination, and stay in a hotel and talk to adults and drink a teensy bit and not deal with short people saying, "It's not fair!" and "I'm bored!" roughly every 1.7 minutes. Never mind that my wild night out was spent, in great part, watching seven eleven year-olds jump on the beds in my hotel room. In the face of his great gift, not finishing the sweater before I left seemed minor. A moment of appreciative silence, please. There was a baby eating cereal Os in the carseat on the way to Elk Grove. There was a bit of reading aloud on the way. There was rain on the way. There was traffic. During the traffic, I figured, "What the heck! I'll knit some more on that collar," since I was nearly done with it. Imagine my horror when I reached into my bag and found the sweater, the collar, and the (circular) needle in two pieces. One needle had pulled right off of the cable. Yipes. I casually asked Thing 2, reading aloud to me from Pride and Prejudice from the back, how she was with picking up dropped stitches in ribbing. She calmly responded that, since she had never picked up a dropped stitch, she didn't know how she was with it. Made sense to me. Fighting panic, I slooowly reached over (traffic is beginning to move a little more briskly at this point) and picked up another needle. I lifted the orphaned stitches onto it and put the whole mess down, resolving to buy a new needle as fast as I could after we checked into the hotel. I also decided that perhaps knitting on an interstate wasn't the wisest choice to make. There turned out to be a yarn shop not two blocks away from the hotel. Now I'm going to rant. It really was two blocks away. But you couldn't walk there, nooooo. Elk Grove was, I assume, once a lovely teeny town surrounded by beautiful, productive farmland. I don't think there really was a downtown, because it wasn't much of a town. It was, well, if my eyes didn't deceive me, farms. Now, it's a collection of indistinguishable stucco housing developments going up like mushrooms in mulch, plus strip malls. Just what the world needs -- more imposing middle-class houses with large garages in front of them. One couldn't walk the two blocks to the store/shoppe in the Brave New Olde Englund that is suburbia today. It's all cars, all the time. Walking to the shoppe would have endangered our lives because the streets are huge, there are no sidewalks, and despite the "compact" signs painted on the parking spots in the asphalt scars over former pastureland, sport-utility vehicles are the new farm trucks. And the yarn was pricey. 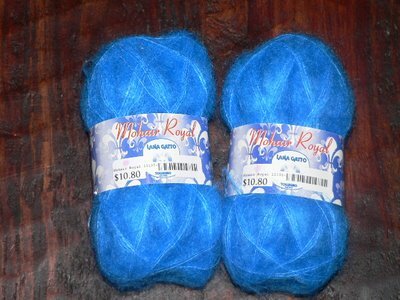 But they had the needle I needed, and I heeded the pleas of Thing 1 for souvenir yarn and got two balls of this, fortunately on sale, for a scarf. 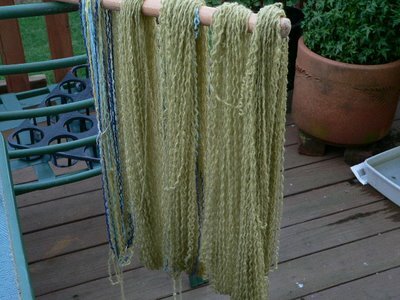 Wasn't there a mohair scarf with a leaf or vine motif all over the blog world? Suggestions welcome. We all know about my lace issues -- be gentle. Front view. I particularly like the penguin pajamas with it. Despite my fears, I had scads of yarn left. 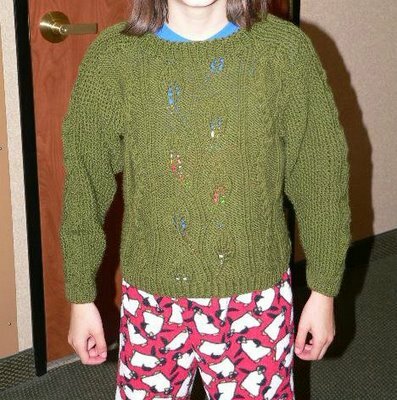 I could have knit this child a two-year sweater. Instead it fits her perfectly, if a little retro-trimly, right now. Better pictures later. She wouldn't take it off today for me to bring it home. I came home -- with a baby who now has teeth -- to happy, tired kids and a vacuumed house. Eric also managed to start the framework for Chicken Jail. The birds are getting a little antsy being cooped up, but it's all that little bird's fault. He's won the Above and Beyond the Call award for the weekend, and it's only half over. There's just something about this team. Remember, they have to conceive of and execute everything themselves. They were ably led by my buddy Lisa, who seemed to be able to guide them without being either overbearing or driven mad, and they simply sparkle. No matter if they placed in the competition or not (the announcements weren't made yet while I was there), this experience has blessed the kids with great memories and deepened their friendships in ways I couldn't have predicted. 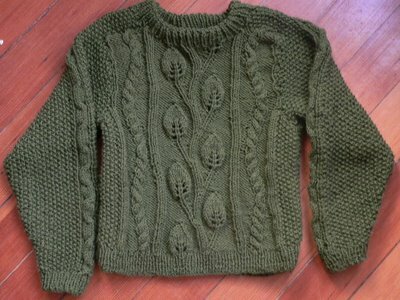 So maybe all I got was the finished sweater (50 days start to finish -- a personal record, I think) but we all got much more. Yesterday was an exciting day. Our smallest hen, the Sicilian Buttercup, had gone on an unauthorized walkabout the evening before, despite (because of?) the new pen. Frantic, weeping children and dire predictions of store-bought Easter eggs, as she's the only hen who lays white eggs suitable for dyeing, ensued. The morning was spent fruitlessly searching and printing up "Lost Hen" posters. We had to wait until the late hour of 9:00 a.m. to call the city Animal Control, who cheerfully told us that they had just gotten a call the evening before about a chicken. The kids asked if I thought it might be ours. "How many hens could have gotten out in this city last night?" I asked them. The authorities couldn't remember where, exactly. . . but they'd let us know. Five minutes later we got a call from a lovely woman in a direction we hadn't thought to look, who said, "Yesterday, I was out front pulling weeds, and this chicken came walking across the street. She was really friendly." That's our girl! We assembled a thank-you present of some eggs and paraded to the next block to reclaim the prodigal. Unfortunately, every time she's out of the coop, she flies to the top of the pen to escape again. They're all under house arrest now. It's a good, 2-ply 100% wool, and I'm looking forward to working it into something nice. Why can I indulge in fantasies like this? Please forgive the blurry picture and the slipper toe. I was too excited to hold the camera still. Since Things 1 and 4 and I are going to spend the night away from home tonight, in order to participate in the state competition tomorrow, I plan to turn these quadrants into an actual sweater tonight and tomorrow. We'll see how successful my cap shaping changes were when I sew it up. 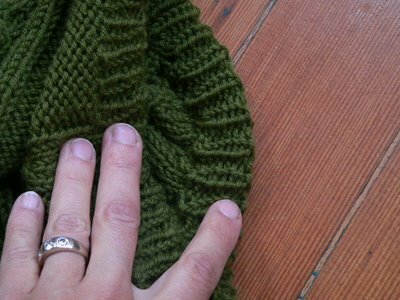 My Danish friend says she knits everything from the shoulders down in the round, because she hates cap shaping. Maybe. I didn't confess how difficult I found making sleeves symmetrical without simultaneous knitting, just thanked her for her suggestions and backed away. While the three of us are gone, the home remainders have been making noises about "walking to the candy store" and "playing Daddy Crocodile." I wonder if they're going to have time to put a roof on the chicken pen? Probably not. It's good to be needed. 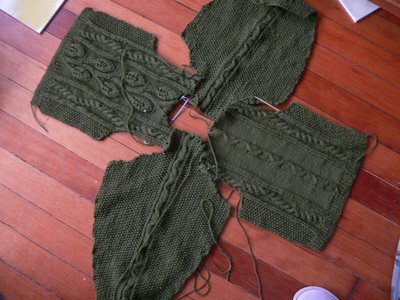 Despite Rain's prompting, er, nagging and shouting, I have NOT finished the sleeves. I never told you I was a fast knitter -- in fact, I remain a quite slow one. I'm going fast for me on the sweater as it is! Meme instructions: Look at the list of books below. Bold the ones you've read, italicize the ones you might read, cross out the ones you won't, underline the ones on your book shelf, and place parentheses around the ones you've never even heard of. Feel free to do this if you haven't yet. Despite the appearances, we are not currently having an earthquake and the cases stand roughly upright. I have lots of books, but few on the list. The library has become a very important resource for my reading, especially for newly released books. It's part of my "don't drown in stuff" approach to life. With roughly a bazillion children, I can't also have lots of stuff and be happy. This philosophy doesn't explain the as-yet-unused spinning wheel on top of that shelf, though. I need to email our teacher so the kids can begin to make themselves fiberly useful. Not exactly a trick, really. I forgot, in the WIP it out thingy -- those dratted Jaywalkers . They're not so bad, but I have a sneaky suspicion that they're not going to make it out of the WIP pile whole. After all of that moaning about the pattern, and figuring it out, I don't like the feel so far. I'll get them and find them and think about it some more, but I think this would be a nicer choice for the more subtle-than-it-appears Lorna's Laces yarn. I certainly have more to think about before I make any decisions. Oh, and today is my lovely mother's birthday. (And my aunt's, also.) Happy birthday to two of my favorite women. How is it, you think, that I remember to send cards to my mom but not her twin sister? Fluff fer brains, I tell you. 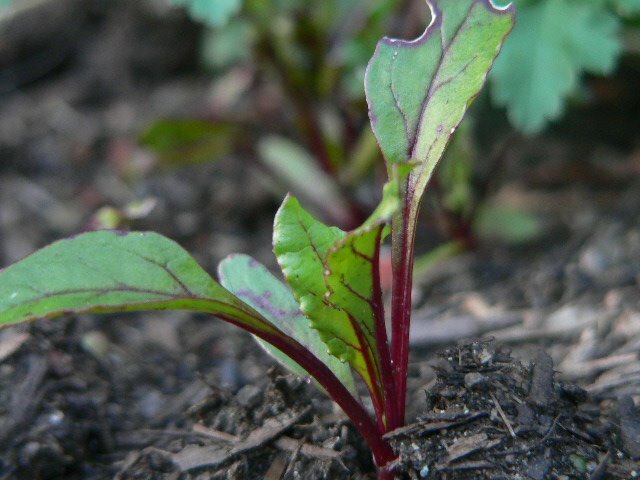 I'll have to blog in tedious detail about the seedlings showing their wee green heads at some point. For now I'm going to turn in. Maybe maybe maybe I'll get those neverending sleeves done tomorrow. Maybe it'll still be April Fools' then.